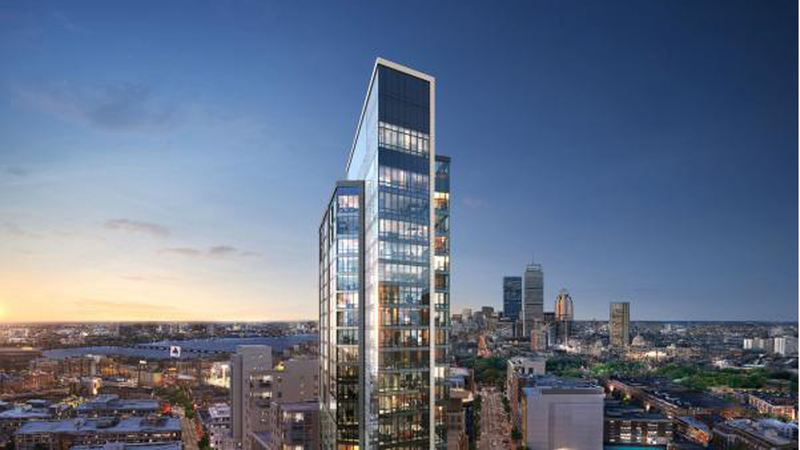 The western gateway to The Fenway, The Pierce Boston will be a mixed-use tower built to house 109 luxury condominium units, 240 rental units and over 20,000 square feet of street-level retail space. Wrapped in a curtain wall designed by Arquitectonica, a world-famous architectural firm based in Miami, FL. The building is a positioned to become a Fenway standout. The building is designed to maximize 360-degree views of Boston, Cambridge, the Charles River, and the Emerald Necklace. Residents of Pierce Boston will enjoy incredible views of the Bos-ton skyline and an extensive amenity package including a spectacular rooftop pool and deck. An exercise in sustainable design and construction, Pierce Boston is targeting LEED Silver status. The top floor will feature an outdoor pool and roof deck with cabanas, as well as an indoor lounge with a suspended glass floor, fireplaces, and dramatic views. Private roof deck cabanas are also available for purchase starting at $300,000.